This post gives an overview of the Expert, GM and Super GM collections, and a brief review of the Expert puzzles in Sudoku vol.3 by Xaq Pitkow and Chronicle Books. 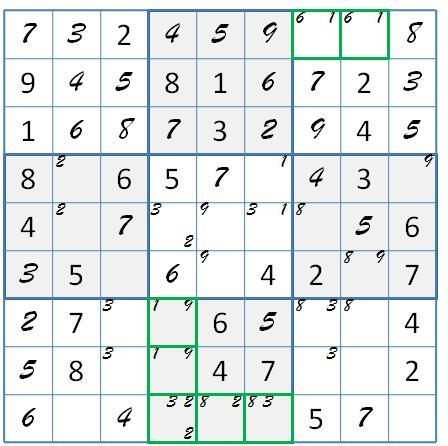 There are 75 Expert, 100 Grand Master, and 25 Super Grand Master puzzles in Sudoku vol. 3. Don’t be intimidated by these titles. The chess themed collection titles exaggerate the levels of difficulty these puzzles achieve, but that’s no surprise. That is how Sudoku puzzles are marketed the world over. What is more puzzling is why a Sudoku puzzle book would be titled Sudoku, as if it were the only one. Here I will briefly review the Expert collection. Workiing on these in airports and on planes, with the handy little spiral notebook in hand, I had moderate success, but with even more than my normal level of mess ups. 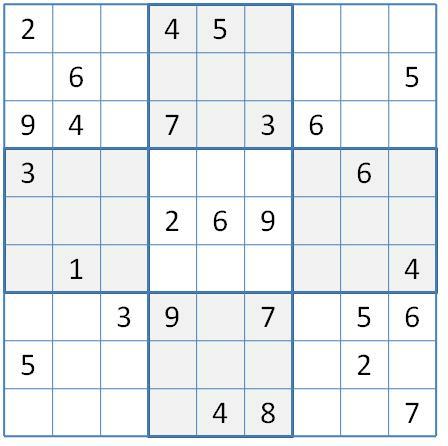 So in an attempt to account for this, I pre-selected five Expert puzzles to review as I normally do, with the aid and comfort of my sysudoku tools. I picked Expert 2, my first mess up, and every 15 thereafter. The review table below does partially explain my traveling experience. I think it fair to say that these results reveal inconsistency in sysudoku difficulty level. Basic solving competence is required, but moderately advanced solving is not always enough. You know about Expert 2. Expert 32 collapses in box marking, but the solver has to recognize when slink marking creates a naked quad. All of the others get to line marking, with two collapsing on the first line. Expert 47 and 62 trip on the easily recognized form of XYZ-wing that is rare in advanced level puzzles. Expert 17 goes way past the others, and actually into expert territory, with its victim’s grouped forcing chain vision of a hidden remote pair’s toxic sets. My frequent mess ups probably came from the mental overload of the deluge of markings characteristic of Pitkow’s puzzles. The deluge is hinted in the table above by unusually large numbers of clues and marks in box marking and line marking. 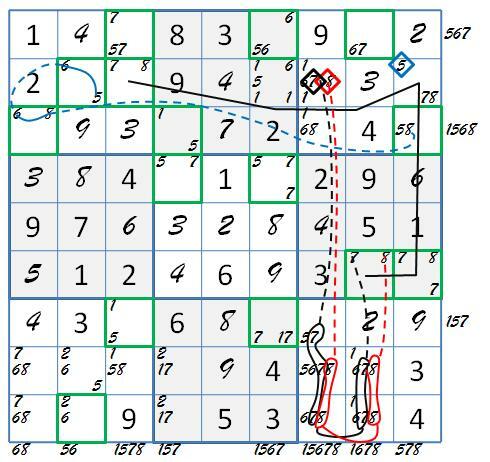 You see exactly what I mean if you did the basic solving of Expert 2. Am I right? Here’s the grid as you started line marking. Can you do that marking while listening for boarding announcements? Well apparently I can’t. The trace above details the final collapse. Just for the halibut, you might want to see the wing removal and hidden remote pair circus of Expert 17. The 156-wing is simple but the removal is ER. Is this expert or beyond? An XY-ANL removes 5’s, revealing a 78 link for the remote pair. 7 & 8 see second toxic end via forcing chains. The 7 group in SEc8 is removed by boxline exclusion. Next up is my review of master Pitkow’s Grand Master offerings. 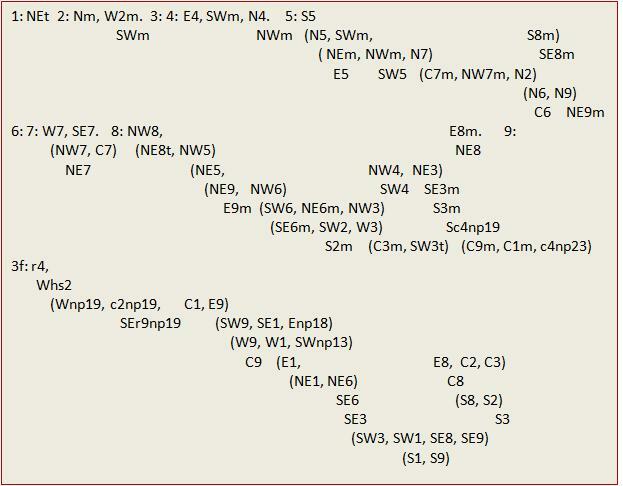 You can start with basic solving of GM 5. If you keep going, and reach the Sue de Coq verification, hang in there and just remember what these did to Golden Nugget. This entry was posted in Advanced Solving, Basic Solving Procedures, Pitkow, Puzzle Reviews and tagged ER wing, Expert Sudoku, Pitkow review, remote pair. Bookmark the permalink.